Although many academic urban planners have been disenchanted with the "Towers in a Park" urban design schemes of Le Corbusier, the famed architect, the marketplace appreciates tall buildings with great views and this stretch of York Avenue is one of the best such examples. Several luxury apartment towers line the west side of the avenue from the high 80's to the low 90's and all offer fabulous views of the East River, the Triborough Bridge and Long Island Sound. All of the towers were erected by Glenwood Management, which specializes in full-service luxury post-war rental apartment towers. All these buildings also have many good views in other directions as well because the mid-block buildings to the west are low-rise. The views are not the only attraction here as the neighborhood is quiet and the Asphalt Green recreational center is across the avenue and Carl Schurz Park, which has an esplanade along the river, is only one block to the east. 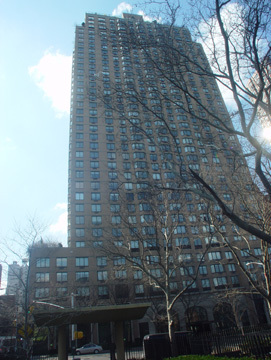 The building has a health club, a sundeck, a 24-hour doorman, a bicycle room, storage space, video security, a private garden, a children's playroom, attended service entrance, and a free shuttle to the subway on 86th Street at Lexington Avenue. 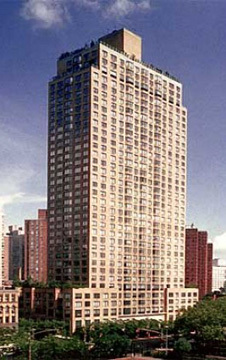 It has 329 apartments and was designed by Philip Birnbaum. Valet and maid service are optional. There is excellent cross-town bus service on 86th Street with a stop nearby.